NEW DELHI: The much anticipated battle between the two newcomers, Chennai City FC and Minerva Punjab FC failed to provide a winner as it finished 0-0 at the Jawaharlal Nehru stadium in Chennai, thus enabling both the teams to notch their first ever Hero I-League point. 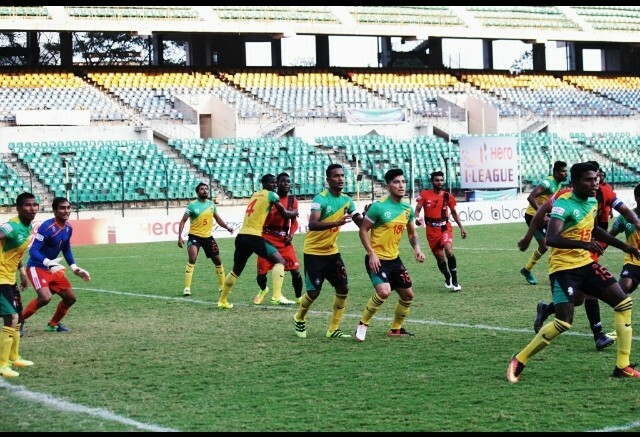 Chennai City decided to line up in a 4-5-1 with Debabrata Roy and Joseph Clemente playing as full-backs while Dharmaraj Ravanan and Aniyeche Echezona were the central defenders. Dhanpal Ganesh, Denson Devadas and Haroon Amiri were deployed in midfield with Brazilian striker Charles De Souza leading upfront. For Minerva, Ravi Kumar started in goal with Nigerian defender Loveday Okechukwu and Arashpreet Singh in defence. Germanpreet Singh and Vinit Rai were in midfield while captain Manandeep Singh and Joel Sunday assumed the attacking mantle in a 4-4-2 formation. It was the visitors who started the game on a better note but Chennai City fashioned the first real chance of the game in the 5th minute but no one could latch on to a square-pass from Charles. 5 minutes later, Lalnun Mawia had a free header at goal but it went straight at Minerva Goalkepeer Ravi Kumar. Joel Sunday, who was under tight marking from Echezona, created a chance for Manandeep but the shot was well saved by Karanjit, who was excellent all throughout the match. The match soon settled into a midfield battle but it was Lalnun Mawia who had the best chance of the night in the 34th minute. Dhanpal Ganesh started the move, brilliantly winning a ball in midfield and played Haroon Amiri clear. Though his first cross was blocked, the second one fell to an unmarked Lalnun Mawia but his left-footer went straight to Ravi Kumar. Changing over, Minerva decided to make two changes — Uttam Rai and Vishal Kumar coming in for Nuruddin and Gurjinder Kumar. But it did not seem to have an effect as the home side seemed to be creating more chances. Charles went close in the 47th minute while Amiri did well to get into the Minerva box before the alert defenders cleared the danger around the 60-minute mark. In an effort to open their account, Marcos Tank was introduced in place of Charles for Chennai City. The burly Brazilian got into a couple of promising positions towards the end of the game but could not hit the target. Minerva now face a long trip to Aizawl while Chennai face the daunting task of taking on the defending champions Bengaluru FC in the next round.